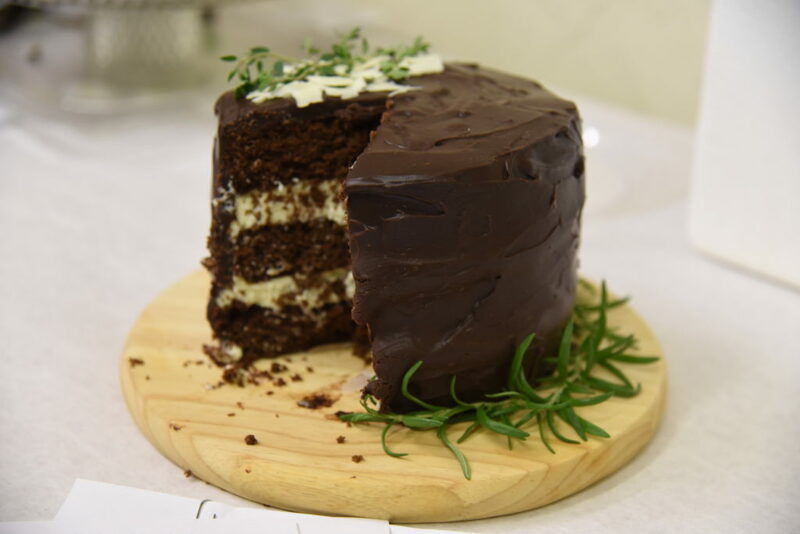 This is a dense, creamy chocolate stout cake layered with a light rosemary thyme infused mousse, then slathered with a thick chocolate ganache. Recipe makes on 6″ cake. It may be doubled for a 9″ cake. Preheat oven to 350 degrees. Grease and flour three 6″ baking pans. Place coffee, stout and butter in a saucepan. Heat until butter melts. Remove from heat and whisk in cocoa. Set aside to cool to room temperature. Whisk together flour, sugar, baking powder, salt and espresso powder. In a large mixing bowl, beat together eggs and yogurt. Alternate adding dry flour mixture and wet stout mixture in three batches until combined. Pour batter into prepared pans. Each pan should contain 15-16 ounces of batter. Bake for 35 minutes. Allow to cool in pans for 10 minutes, then remove from pans and cool completely on cooling rack. Place rosemary, thyme, orange zest and 1 1/2 cups heavy cream in a saucepan and bring to a simmer. Simmer for 10 minuts, then cool. Strain through a strainer to remove herbs and orange zest. Bloom gelatin in 1/4 cup of infused cream. Place rest of cream back in saucepan with white chocolate and heat until chocolate melts. Stir in bloomed gelatin. Place saucepan in refrigerator and chill until firm (about 2 hours). Remove chilled mixture from refrigerator and whip with mixer until light and fluffy. In another bowl, whip remaining 1 cup heavy cream into stiff peaks. Fold into infused cream mixture. Place back into refrigerator until ready to use. In a saucepan, heat heavy cream to a simmer. Pour over chocolate and corn syrup. Stir until smooth. Ganache will thicken as it cools. Cool to desired consistency to ice cake. Spread mousse over two cake layers, reserving about 1 cup. Chill mousse covered cake for at least 30 minutes to allow mousse to harden. Once mousse is hard enough to support stacking, finish assembling cake using reserved mousse to help keep layers together and fill in any gaps. Crumb coat with ganache and chill for at least another 30 minutes. Finish icing with ganache and decorate as desired.